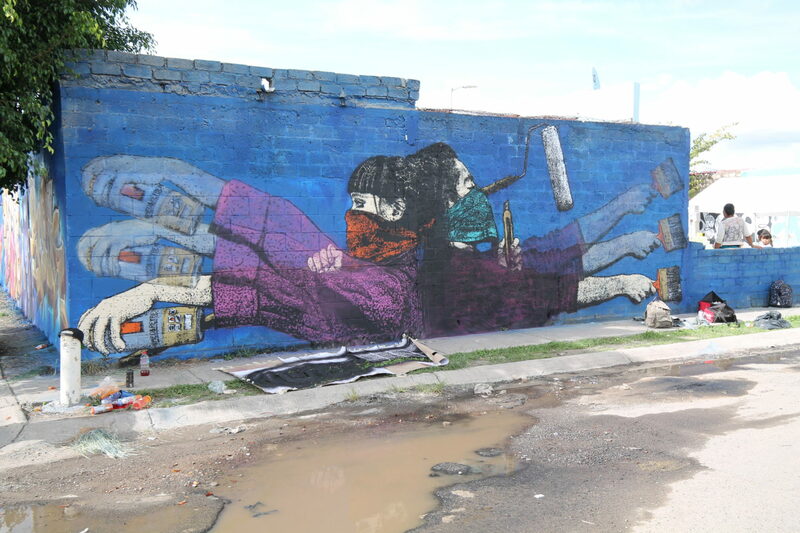 Graffiti Workshops at the Festival Internacional Cervantino: Access, Exclusion, and Innovation in the Shadow of the International Art Festival – Caitlin Frances Bruce, PhD. The Festival Internacional Cervantino (FIC) is a world-class art festival held in Guanajuato, Guanajuato for the bulk of the month of October. The programming is diverse in terms of artistic medium and country of origin: in the same day one can see a play be a French theater troupe, a DJ session by a Chinese MC, and then see students, some dressed in 18thcentury velvet breeches and hats singing as they make their rounds to the bars (Estudiantinos). The festival is an enormous tourism draw, and the ancient city with narrow cobblestone streets and steep hills is full to bursting with foreigners. What then, of local residents? In 2014, there were the first set of graffiti and hip hop workshops hosted at the festival.This year there were offerings of free graffiti, stencil, yarn bombing, break dancing and rap workshops. These events were organized by a DF based organization called Circo Volador,and were a response to the “¿Nosotros Que?” movement. “¿Nosotros Que?” is what local Guanajuatense residents formed to call attention to the exclusionary effects of the FIC, where city residents could rarely afford to pay to enter the events that were hosted in their own city. “What about us? They asked,” Israel, one of the workshop leaders, explained in an interview. The graffiti workshops were offered for three days in a row with the idea of creating a collaborative mural out of the temporary wall that would be covered in aerosol paint and stencils. These three-day workshops were held near the Ex-Estacion de Ferrocarril, the site of Guanajuato’s former train station, a key center for the movement of metals throughout the republic in the 19th and 20thcentury. Now it hosts NGO and government offices, with a maze of tianguis on one side, and then a colorful maze of 1 or 2-room shacks to the right, with mountains peppered with colorful houses behind. There was a wrought iron fence by a brick walkway with images of cameras and sometimes phrases like “punto de vista.” A group of youth in uniforms, likely in prepa, were giggling in packs and taking photos by the scenic points, and a group of four men sat together on a bench, gossiping and smoking, seeming to be somewhat drunk. They were in front of a large white temporary wall which was about 30 feet wide and 20 feet high, about 1.5 feet thick. View from workshops site. Guanajuato, Gto. 10/19/2017. Photo by Caitlin Bruce. There was also a stage and stadium seats built into a hill, and there more youth lounged while a couple of writes painted outlines. People in t-shirts with a cholo on the front, Cervantino in gothic script, and then their names or nicknames on the back were setting up tents, tables with stations with paper, pencils, and markets. I asked about the graffiti workshop and was walked to the temporary wall and told to take a seat and wait there. I wandered a bit, hearing paint wandered to the stage and was watching the breakdance area, and was told they were painting a background for the dance workshops, and that the graffiti workshop was something different. Stage for breaking workshop. Guanajuato, GTO. 10/19/17. Photo by Caitlin Bruce. I waited about 30 minutes, and at around 10:30 I saw a group of high schoolers, about 15, led by a teacher. I introduced myself to the workshop leaders, Geraldo and Israel from the town of Torreon in the state of Cuahila, south of Sonora and near Zacatecas. This is a border town, and is among one of the first places where graffiti started in Mexico, Geraldo (aka Caporal) attested. He has been writing since 1997. Israel recounting graffiti history. Guanajuato, GTO. 10/19/17. Photo by Caitlin Bruce. Caporal explaining differences in tagging styles. Guanajuato, GTO. 10/19/17. Photo by Caitlin Bruce. Geraldo demonstrating a fill in with effects. Guanajuato, GTO. 10/19/17. Photo by Caitlin Bruce. Geraldo demonstrating cholo style tag. Guanajuato, GTO. 10/19/17. Photo by Caitlin Bruce. “There are hundreds of styles of graffiti,” Israel continued, “but no matter the style it is all about the need to communicate and express yourself.” He mentioned that some street art/arte urbano has become worth a lot of money, there is someone called Bansky, no one knows who they are, but it is probably a team and if he or they painted on your house it would be worth a lot of money, someone might come and try to take it off and sell it.” “For millions,” a youth added. This youth was from Leon and was clearly already an accomplished tagger because what he painted was fluid and defined. When Gerald finished his mini piece he asked, “Preguntas? Dudas? Does anyone want to paint?” “You should paint!” someone said to one of the young women. “Noooo!” she demurred, giggling into a group of girls, who also exploded into giggles. “Write ‘Paula!’” one of the boys persisted. She ultimately ended up painting, and Geraldo helped another girl with her piece, creating an outline that she could fill. The youth painted and played around for another 10 minutes and then the teacher thanked the instructors and led them away. Then the guys stayed at the wall, answering questions and giving mini summaries of the history to the curious. Students trying out tagging. Guanajuato, GTO. 10/19/17. Photo by Caitlin Bruce. When I asked Israel about the experience of teaching the workshops he said that he enjoyed leading them because “Everyone has a different perspective about graffiti, young, old, and each place has different problems that youth face and the youth in each place have different needs.” I asked about the problematic he had divined in Guanajuato. “This city is a site for global historic patrimony, so there are few to no places for youth to paint, and it is frustrating, because they need to communicate.” This raises a key question about the limits or the friction of legal graffiti regimes in the wake of historical patrimony. In Guanajuato, which is seen as a site for historic patrimony, graffiti is largely understood as a kind of damage to historic walls. Yet, the city is an active site of residence and public life for thousands, and so what right do they have to make their mark on its environs? Exploring Guanajuato itself over a series of four days I found little graffiti but a fair amount of wheat pasting, not surprising given the large number of print shops in the city. Only on a bus back to the bus station did I see some burners on the side of a car shop, an out of the way place on a sharp diagonal gradation of ground on the side of a hill. It is nor surprising, in some ways, that graffiti, an art form that is fairly marginalized in Guanajuato is used as a means of changing (slightly) how access is calibrated. On the one hand, the workshops as part of FIC offers a model of providing access to what might feel for some to be an elitist and exclusionary festival. It highlights challenges and possibilities for youth and city spaces. On the other hand, it could be seen as a kind of compensatory gesture: locals are not offered free entry into the more central events, and the temporary wall itself it was on a hill and not visible in the city center below. Like Art Basel’s public art events, they occur outside of and alongside the festival, perhaps reaching more plural audiences, but do not provide access into the “central” site itself. What would it mean for the FIC to integrate live painting into its concerts, dance performances, and plays? Though the FIC includes programming from local arts groups and free, open-air film screenings and art exhibitions, what would it mean to provide full access to city residents? Would it create informal economies of residence qualifications like that which precedes South By Southwest? Would it generate a larger sense of ownership of the festival for residents? Rap workshop. Guanajuato, GTO. 10/19/17. Photo by Caitlin Bruce. “Come to scribble! 10:00am…Legalize…” Guanajuato, GTO. 10/19/17. Photo by Caitlin Bruce. * Muchas gracias a Caporal y Vlair para las entrevistas, y el equipo de Circo Volador para la experiencia.